I'll be taking down my old website soon, so I'm converting some of my old pages into blog posts so they don't vanish from the internet forever. This is one of them. 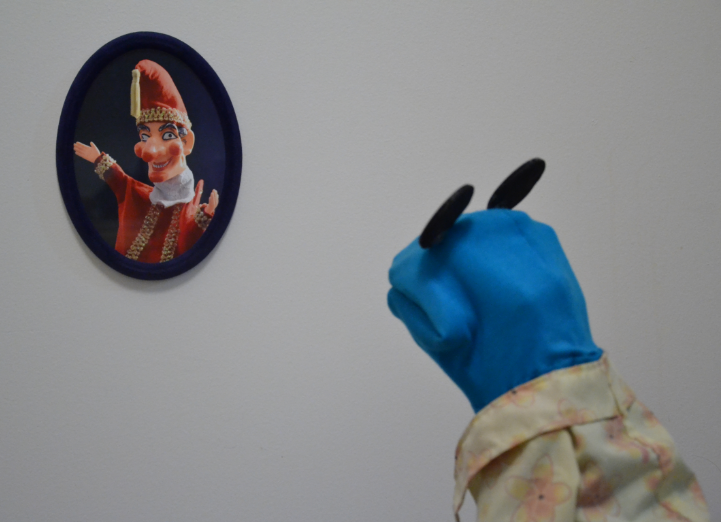 In my children's puppetry workshops, I explain that there are many different kinds of puppets, ranging from shadow puppets to marionettes. 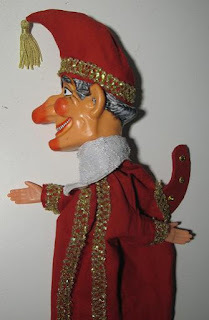 When I talk about simple hand puppets, the example I always use is the centuries-old character of Mr. Punch. 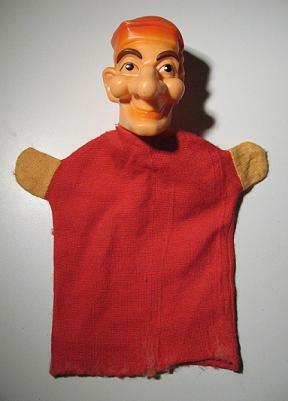 I never actually had a puppet of Mr. Punch to show to the kids, and I'd never been able to find one for sale. So at the 2011 Puppets Up! festival, I bought the rubber-headed puppet seen above from Joanne Bigham of Open Door Designs. He wasn't exactly Mr. Punch -- he seemed to be intended to represent his German cousin Kasperle -- and so I set about modifying him. I discarded the body altogether and kept the head. 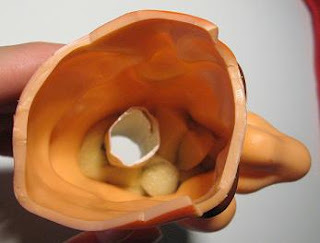 I rolled a piece of card into a cylinder and glued it into the hole in his neck, reinforcing it with pieces of foam inside the head, so that it would fit more snugly over my finger and give me more control during performance. The nice thing about a character like Punch is that everyone has a slightly different interpretation of how he should look, so I was able to pick and choose my favourite elements from all the versions I've seen. For example, I wanted his hat to be shaped like Richard Doyle's illustration for the cover of Punch magazine. I still had a plastic banana left over from my video "Viewer Mail #1", and it was just the right shape. I cut a hole in the top of his head and glued the end of the banana into position; this would form the internal structure of the hat. 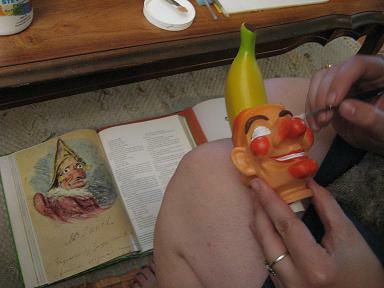 My girlfriend [now wife], artist Julie Cruikshank, repainted his face for me, as he looked far too kindly. Our inspiration came from the Punch illustrations of George Cruikshank (her ancestor? 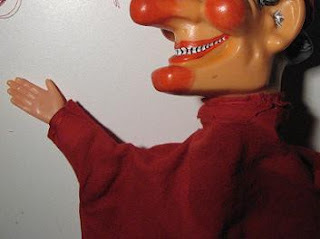 ), and the grey hair was based on Richard Coombs' amazing Punch and Judy show (a tiny portion of which can be seen here). Now he looks like the kind of guy who would throw a baby out the window. 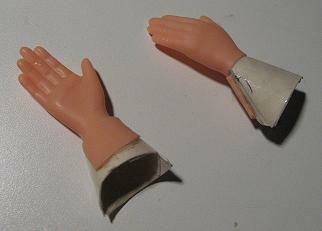 I ordered a pair of plastic doll hands from Etsy seller "The Pattern Guy" and glued them to some rolled-up pieces of card that would fit snugly over my thumb and middle finger. I made sure to make them both big enough to fit over my thumb, so that I could wear Mr. Punch on either hand. After some trial and error, I successfully made a pattern for his hat by draping a paper towel over the banana and trimming. I based the pattern for his body on the puppet's original body, purposefully making the neck, sleeves, and "skirt" longer than necessary in order to fit my hand, reasoning that I could always trim them back. The shape of Punch's extremely stylized hump was based on a couple of different sources, and the fabric pattern was built around a piece of corrugated cardboard to give it the two-dimensional look seen in the Cruikshank illustrations. 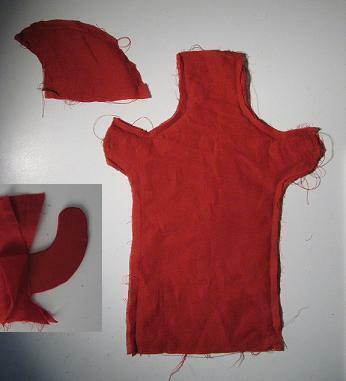 I attached the head and hands to the body by tightly sewing the fabric around their narrowest points. The hump was attached by simply sewing it onto the back of the body, and the hat was glued into place at a few spots along its base. 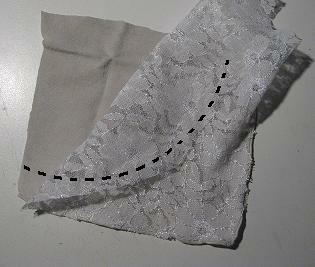 His collar was made by sewing a piece of lace to a piece of white fabric along their edges, cutting into an appropriate shape (roughly along the dotted line seen above), and then sewing it around his neck. 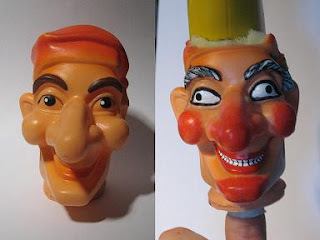 This had the added advantage of disguising the messy attachment point of Punch's head to his body. 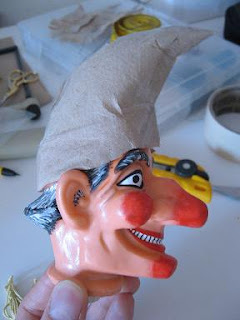 The tassel on his hat came from a bookmark, and lining the base of his hat with gold trim was an idea taken from Jan Svankmajer's Punch and Judy film. Additional trim was sewn around his sleeves, around the base of his hump, and in two parallel lines down his front. The baubles on his hump were again based on Cruikshank, and were simple dollar-store gemstone stickers, three on each side. And that's it! Now I've got my own Mr. Punch to show to the kids at my workshops. Comparing this picture to the one at the top of the page, they don't even look like the same puppet. Moss admires a portrait of his great-great-grandfather.